Mark and Ruth’s parents sell their plantation and move to Florida. The children have many adventures in their new home state. Source: Munroe, K. (1886). Wakulla, A Story of Adventure in Florida. New York: Harper. "Preparing to Leave the Old Home"
Mark and Ruth’s parents sell their plantation and move to Florida. The Elmers board a train for the first time and then board a schooner called the Nancy Bell. They offer Jan Jensen a job. The Elmers talk to a superstitious captain. He talks about the death of a captain. "A Wreck on the Florida Reef"
The Nancy Bell comes upon a wreck. The captain and the Elmers tow the wrecked ship to Key West. "Mark and Ruth Attend an Auction"
Ruth writes a letter to her friend Edna. Ruth and Mark go to the auction. The court awarded the Nancy Bell five thousand dollars. The Elmers and the ship’s crew set up camp. "Arrival at the New Home"
"The Sunday School, and More Mysteries"
Mark and Ruth find an organ. A wounded dog enters the kitchen. They meet the Bevils. Mr. Elmer is made superintendent of the Sunday School. "Mark Discovers the Ghost and Finds Him in a Trying Position"
Mark kills an alligator that has attacked a young boy. Mark brings the boy back to their home. Later, Mark and the men go back for the alligator. "A Runaway’s Story, and its Happy Ending"
Mr. Elmer comes home with Mr. March. Mr. March sees Frank again for the first time in awhile. "The Elmer Mill and Ferry Company"
The town establishes a mill association and names its board. There was a picnic with much merriment and dancing. A bonfire is started at the picnic and the next morning becomes a wildfire. It catches the house on fire. Mr. Elmer goes to Tallahassee to buy cattle. "How the Boys Caught an Alligator"
Mark and Frank become best friends. They try to capture an alligator. "A Fire Hunt, and Mark’s Disappearance"
Mr. March and Mr. Elmer go looking for the boys. "Buried in an Underground River"
Mark falls into a sink hole. His father gets to him in time and brings him home to revive him. "Two Letters and a Journey"
The Elmers send Mark away to his uncle’s house to recover. They send Ruth along to keep him company on his journey and to visit with her friend Edna May. Mark plans to travel to New York with Captain Bill in the Wildfire. "The Burning of the ‘Wildfire’"
Mark and Ruth sailed on the Wildfire. The ship catches fire and all must escape on pilot boats. They watch the Wildfire’s destruction. The kids go to New York and see their uncle. Mark and Ruth spend time with Uncle Christopher. Mark attends mill school. In October, Mark, Ruth, Edna May, and Uncle Christopher take a voyage to Wakulla. Mark and Ruth return home. Mr. March discovers that Edna May looks like his dead wife. They realize that Edna is Frank’s lost sister. Munroe, Kirk. Wakulla, A Story of Adventure in Florida. Lit2Go Edition. 1886. Web. <https://etc.usf.edu/lit2go/80/wakulla-a-story-of-adventure-in-florida/>. April 21, 2019. 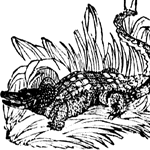 Kirk Munroe, Wakulla, A Story of Adventure in Florida, Li2Go edition, (1886), accessed April 21, 2019, https://etc.usf.edu/lit2go/80/wakulla-a-story-of-adventure-in-florida/.